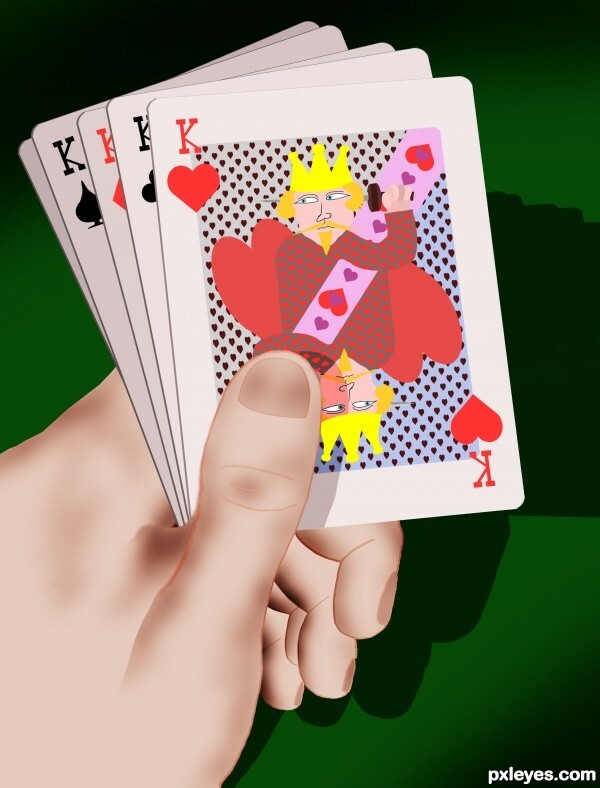 Digital Drawing: Your goal in this contest is to digitally draw a realistic playing card. 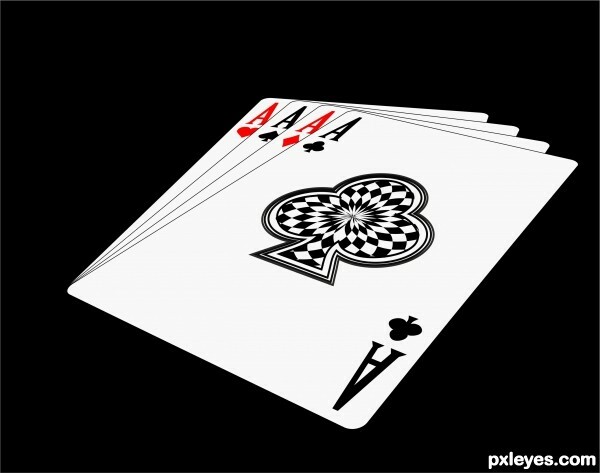 Yes, the good old jack, clubs,... playing cards that are used in poker. Other types of cards are not allowed. 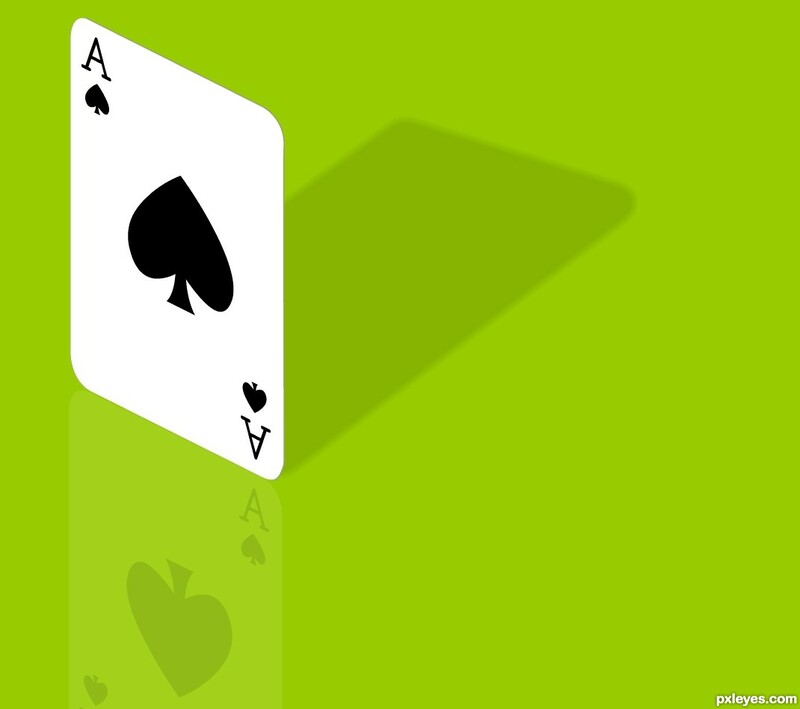 You can pick any card you like from the 52-card deck. Drawing multiple cards is allowed as well. Good luck! Premade shapes (brushes and so on) are not allowed, even the custom shapes that come standard in Photoshop are not allowed. jawshoewhah: Mad, I'm not a mod, but I can tell you right now you are allowed to use any graphics drawing program of your choice but photo shop is just the standard most can relate to. However, you are NOT allowed to use fonts. You must draw them. Here's a list of what you can and can't use in digital drawing contests when using photoshop. Nice textures and especially like how you created the hand. I think you could improve this vastly if the light on the cards wasn't so flat. Try using a gradient or a lighting effect on the cards to remedy this. They also seem to be floating on the table, maybe because of the kind of shadow they have. But generally, the idea is good and its quite well-executed. Agrees with Mad! A very well drawn out idea. GL author! A great looking drawing Nice work. I love all the detail you put into your work....it makes it so fun to look at....the card up his sleeve....the texture of the tweed jacket...well done author!!!! Nice work, author! Love the detail. Congratulations on your first place. your painting skills are amazing. i really need to take notes. Home » Drawing Contests » Cards Dd » I Ain't Bluffin'! I like that you've made the king's face. I also like your technique. Thanks, considering I have no drawing pad and must deal with just a mouse. I mainly used a lot of pencil, brush, free transform and liquefy. Only if the other guy doesn't have 4A or RF. Love the card , the hand needs a bit more defining with shading and contrast. well done though. I agree glockman. Shading with digital drawing is something I still need to work on. HAHAHA!! WISH I HAD THAT HAND! at least JUST once would be nice Great job on this. I have got to come visit so you can teach me stuff! Trust me Amanda, Glockman has the digital drawing thing down. Don't believe me? Go looksie at his portfolio. I need more practice. What a shock! The one entry I thought would be dead last for sure takes 2nd. Go figure? Congrats, Jaws! You did a great job and its impressive that you did this with just a mouse. Now, save up your loose change and go get yourself a wacom tablet. hands down to you, especially doing this with a mouse. its AMAZING. 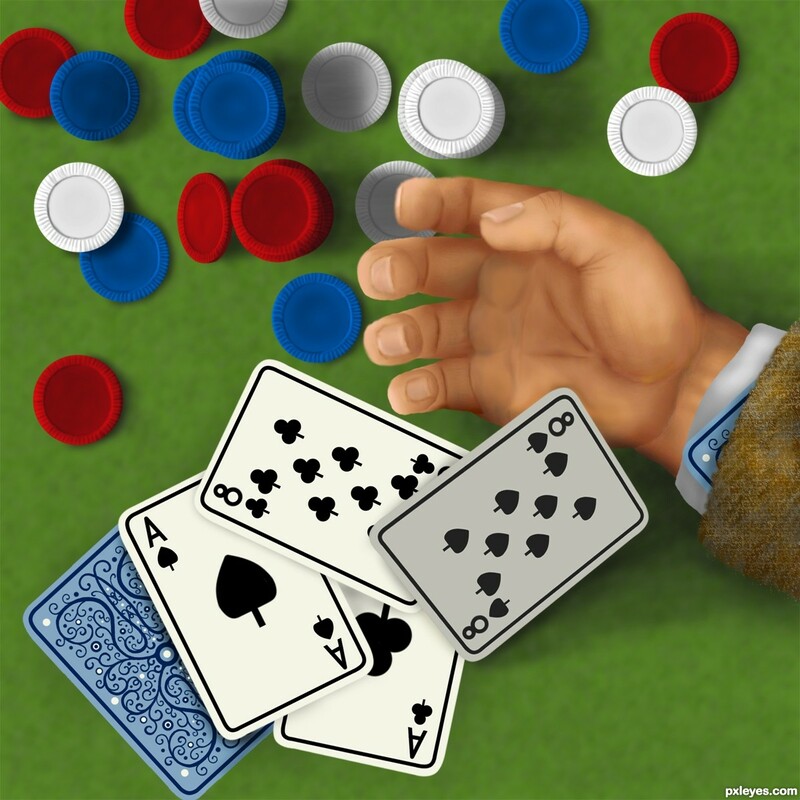 The dice perspective seems to be off, which is taking away from the realism. 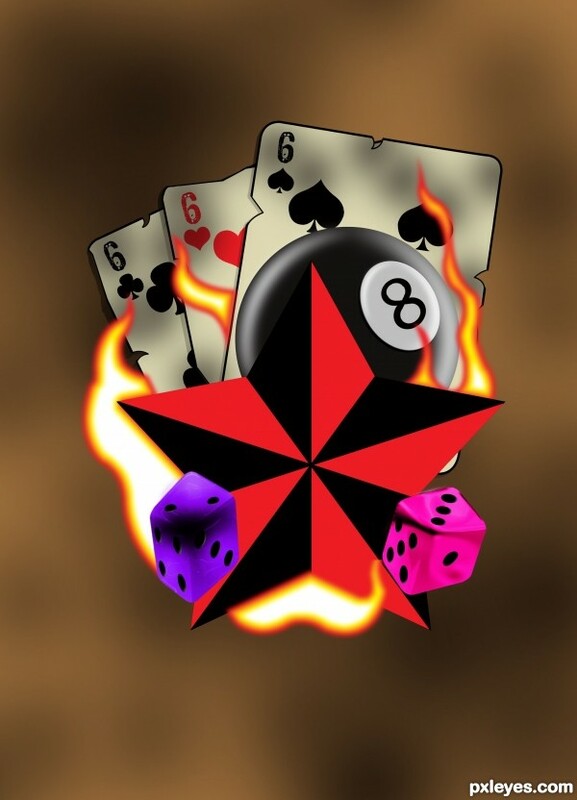 Similarly, it would be better if the 8 ball and star object also received the light and shadow influences from the fire. A nice design, but is it realistic? :noclue? This is a very bold design and it has a wonderfully sinister feel to it...except for the dice. The dice seem to be out of place because of the color and shape. Maybe that's what you were aiming for? If you weren't, maybe you could square them up a bit and change the color. I would suggest they compliment the cards by making them the same pale color with red dots on them. Just an idea. Great job! Love all the aspects of each of the different items you've placed. I like this. Simple and clever. One small suggestion. You could give the card a little thickness by running a very thin line around the edge we can see. That would give it a more 3D look. Thnx for input iDt8r, added a subtle line. Cheers Mad. I like the simplicity in this one!! I like that you added the reflection and shadow. Gives the otherwise simple image a bit more to work with.